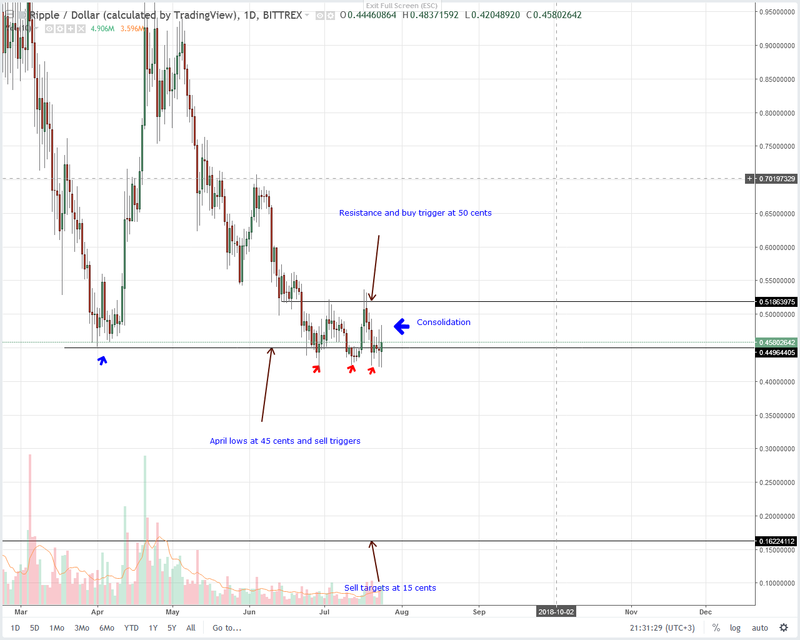 Technically, Ripple (XRP) is bearish and that’s despite news of Wirex support or coin listings in different exchanges around the world which is of course supportive of price. Following yesterday’s high volume XRP bull candlestick reversing from support, chances are we might see a follow through today but that won’t be enough to warrant XRP buys until after Ripple bulls break above 50 cents. Ripple’s RTXP is not only reliable but it one of the most versatile protocol out there. The user case of XRP is particularly important for financial institutions. We have seen it coming through for different banks and even if they sometimes won’t find a place for xRapid or XRP in that case, RTXP tags with it efficiency and cost reduction. It’s in this vein that Wirex is trying to capitalize on user demand by availing a XRP wallet for their customers. Wirex is a UK-based fiat and cryptocurrency card provider that wants to make fiat-crypto payment as seamless as possible. Under this objective, going forward, their 1.3 million customers spread across 130 different geographies will now convert XRP to fiat, receive XRP from external wallets and make point payment in XRP or fiat. That’s on top of trading XRP with Bitcoin, Litecoin and other tokens availed by the company. As expected, such news created a buzz and it got better because in their announcement, the Wirex co-founder said XRP is not only stable and cheap but this high liquid coin is free from Bitcoin’s influence. The XRP-BTC decoupling part shall and will continue to be a point of interest for all level of investors in days to come. After all, Brad Garlinghouse, the co-founder of Ripple said that decoupling will come to effect once we see strong user adoption. This is the fifth week of XRP horizontal consolidation. The bad thing about this consolidation is that its trade range is tight and confined within 10 cents with clear resistances at 55 cents and support at 45 cents. Being a strong bear trend, our interest shall shift to 45 cents, our main support line and 2018 lows. As mentioned in our previous XRP technical trade plans, trading with the trend is advisable and this is even compounded by the close proximity between current XRP spot rates and 45 cents. 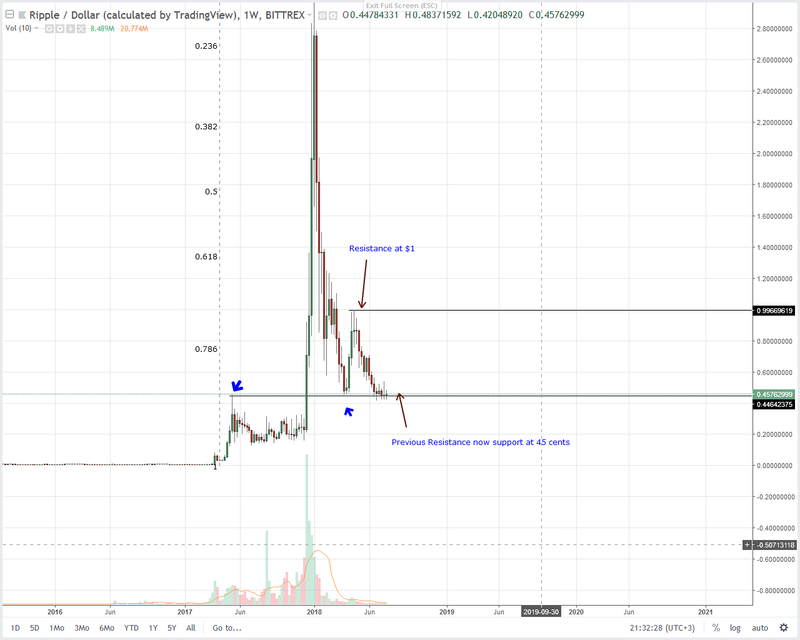 In any case and as spelled before, strong close below June 2018 lows might usher in the next wave of XRP sellers with bear targets at 15 cents. Here, XRP is clearly finding support and even if we are bearish, yesterday’s injection of buy pressure is positive. This rejection of lower lows might pad and form the basis of further gains today and in that case, we shall refocus our attention on XRP and see if bulls would muster enough momentum to breach 55 cents triggering our longs as laid out in our previous XRP trade plan.